..and this summer, it’s better than ever! Now acquiring two locations, Pergola on the Roof proves that it’s launch last summer was an undeniable success. In the heart of West London (the top of the Television Centre in White City, to be precise), Pergola wowed all who visited. Pergola on the Roof creates a sense of escapism from the busy work life of London, whilst the white washed walls, palm trees and decking give the vision of a picturesque hidden treasure in the Hamptons! But that’s not all, West London’s most sought after drinks venue has since expanded itself to form Pergola Paddington Central, so if you work in the city and fancy a few drinks on a Friday night after work, the second and brand new Pergola site could be the one for you! Promising to fuse ‘contemporary urban-design with lush green landscaping’, the new Pergola Paddington Central aims to create an urban paradise, consistently reinforced by the regular and guest DJs. Also, with large communal tables to accommodate, Pergola loves big groups, so perfect for birthdays and work functions! Fancy a bite to eat? Not a problem – Pergola also features an awesome array of top quality pop-up restaurants, ranging from Breddos Tacos, Patty & Bun, 8 Hoxton Square, Decatur and more. 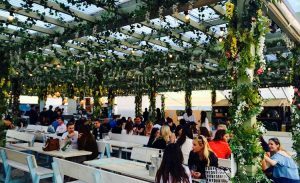 Pergola redefines the typical rooftop garden that has become so prevalent to London nightlife, offering an iconic, vibrant, relaxed festival experience. Both venues are open from now until October 1st 2017, so be sure to head down there – whether you’re planning to hire a day bed for 12, or a romantic evening for two, Pergola is ideal for all!